The State of the News Media in 2016 is uncertain, with daily newspapers looking shakier than ever, digital advertising and audiences continuing to grow, and TV news mostly seeing gains in revenue. 1 Though the industry has been struggling for some time, 2015 was perhaps the worst year for newspapers since the Great Recession and its immediate aftermath. Daily circulation fell by 7%, the most since 2010, while advertising revenue at publicly traded newspaper companies fell by 8%, the most since 2009. At the same time, newsroom staffing fell by 10% in 2014, the last year for which data were available. Coming amid a wave of consolidation, this accelerating decline suggests the industry may be past its point of no return. 2 Digital ad spending went up 20% last year, and mobile advertising now tops desktop, but journalism organizations have not been the primary beneficiaries. There was explosive growth in mobile advertising, which increased by 65%, reaching $32 billion – higher than desktop advertising for the first year ever. Almost two-thirds of this $60 billion in digital advertising spending (65%) went to just five technology companies: Google, Facebook, Yahoo, Microsoft and Twitter. Despite this, legacy news gets relatively little boost from this digital boom. Only 5% of local television stations’ advertising revenue is from digital, according to data from BIA/Kelsey. 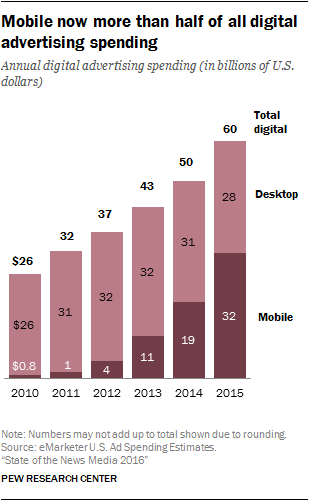 And while 25% of publicly held newspapers’ ad revenue is from digital, they actually saw overall digital ad revenue fall by 2% in 2015. 3In contrast to newspapers’ troubles and digital’s rise, local television news revenue is relatively steady at $18.6 billion – at least for now. 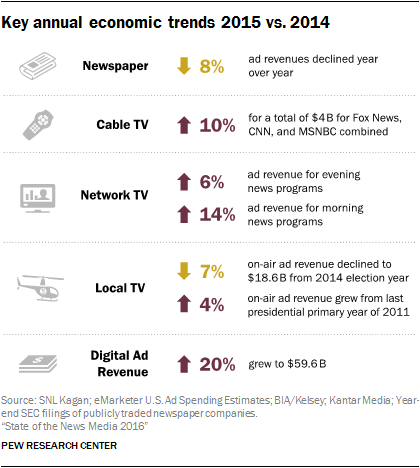 Revenue was down from 2014, but since the industry gets a big boost from election year spending, a better comparison is 2013, which saw a comparable level of ad revenue. Additionally, these stations have been getting a small but increasing boost from retransmission fees, which have risen fivefold since 2010. (Cable systems pay these fees to local network affiliates in return for carrying their programming.) Local TV’s steady stream of advertising and other revenue has helped maintain staffing levels for their newsrooms, which rose 1% in 2014 – a sharp contrast with newspapers’ 10% drop in the same period. But a demographic cliff looms: While local TV has long been the most common source of news for Americans, Millennials’ top source of political news is Facebook. 4 Driven in part by a highly competitive presidential primary season, cable news saw its viewership jump 8%, to an average of 3.1 million viewers in prime time (according to Pew Research Center analysis of Nielsen Media Research data, used under license). This was especially pronounced at CNN, whose prime-time audience grew 38%. 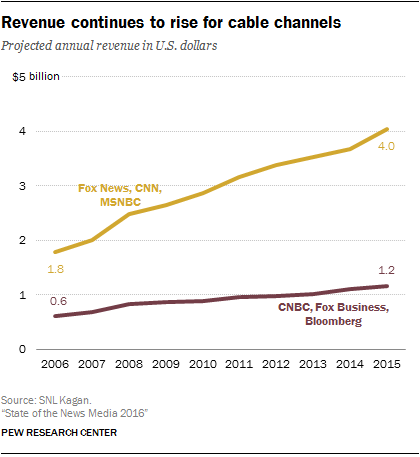 Cable channels gained economically as well, with annual revenue for the three major channels (Fox News Channel, CNN and MSNBC) projected to rise 10%, to $4 billion.